Taking temps can be uncomfortable and invasive ... not with this touch-free model from Veridan! 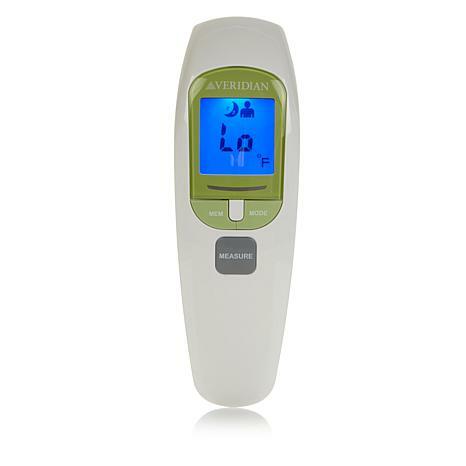 This thermometer effortlessly gives you an accurate temperature reading from the forehead in one second without poking, prodding or lengthy wait time. Plus, a variety of features including automatic shut-off and memory recall makes this more than just a basic thermometer so you can have peace of mind. This product is not intended to diagnose or treat any medical disease or condition. 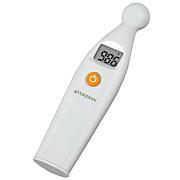 Use of this thermometer is not intended as a substitute for consultation with your physician. This thermometer is not waterproof. Do not immerse in liquids. Never allow the thermometer to be used without adult supervision. The infrared technology used in this thermometer is safe, however, we recommend avoiding looking into the lens during use. Clean the lens before and after each use. Do not touch the lens with fingers. 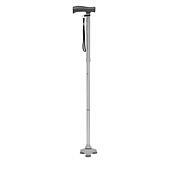 Dropping the thermometer or causing other heavy impact may damage it. Do not store the thermometer in direct sunlight, dusty or humid environments, or extreme temperatures. Do not disassemble the thermometer or attempt to repair it. If a reading cannot be taken, and the troubleshooting steps do not fix the problem, the thermometer must be replaced. Best thing ever! Love that we are not spreading germs like a regular thermometer has the potential for. We love it. I can check multiple kids temperatures quickly. Not to mention my own temperature. Best thing ever! This is a perfect thermometer for all ages. Works great and easy to use. I found this to accurate and extremely easy to use. Also I was having hot water problems and I was able to take the temp to show it to the landlord. Problem solved.